Faceted concrete staircases connect a string of social spaces inside this SOM-designed campus building for The New School in New York, visible outside the building through huge diagonal windows (+ slideshow). The University Center was designed by architecture firm SOM to provide 35,000 square-metres of teaching facilities and student housing for The New School, allowing the university to pull its activities away from sites around the city and consolidate them onto its Greenwich Village campus. Conceived as "a campus within a building", the 16-storey building contains student housing in its nine upper floors, while the seven lower levels accommodate multi-purpose classrooms, design studios, laboratories, an 800-seat auditorium and the main university library. Social areas, dubbed "sky quads", are interspersed throughout the building to provide areas where can staff and students can interact, whether relaxing between classes or working on group projects. Broad staircases create leisurely routes between these spaces. Clad with glass-fibre-reinforced concrete panels, these structures alternate between straight and diagonal trajectories, and some integrate seating areas. "The University Center transforms the traditional university environment," said SOM design partner Roger Duffy. "Rather than compartmentalising living and learning spaces, we strategically stacked these functions to create a vertical campus that supports the kind of interdisciplinary learning that has defined The New School since its founding." Exterior walls are clad with hand-finished brass shingles, intended to fit in with both the cast-iron facades of the Ladies' Mile Historic District to the north and the brownstones of the Greenwich Village Historic District to the south and west. These panels also provide solar shading for windows during the daytime. 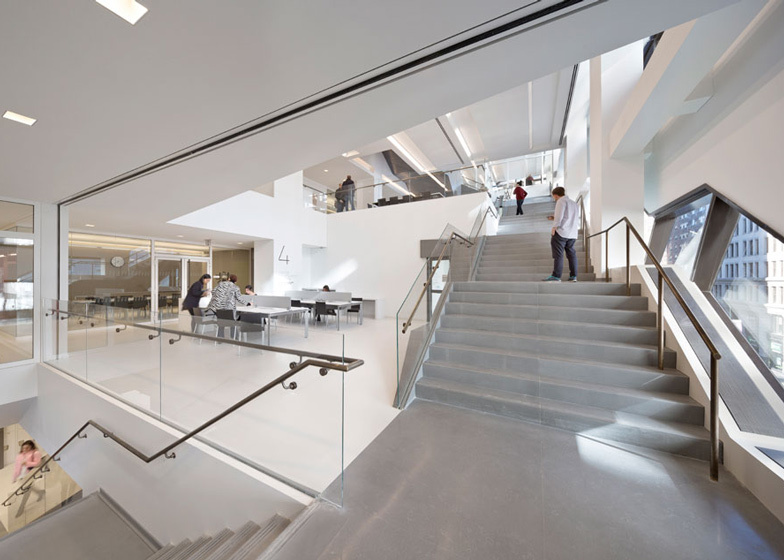 In addition to the staircases that stretch through the building, SOM added fire-safe staircases that students can use to move quickly between floors. The architects also installed skip-stop elevators that miss out floors during peak hours to speed up movement. Three dining areas are located on different floors. Other features include bike storage rooms and showers for students and residents, which the university hopes will encourage cycling. The student housing floors provide accommodation for approximately 600 students and can be accessed via a dedicated entrance on Fifth Avenue. Residents have access to a series of communal facilities in the basement, including a gym, a common room, study areas, art studios, a mailroom and a laundry room. 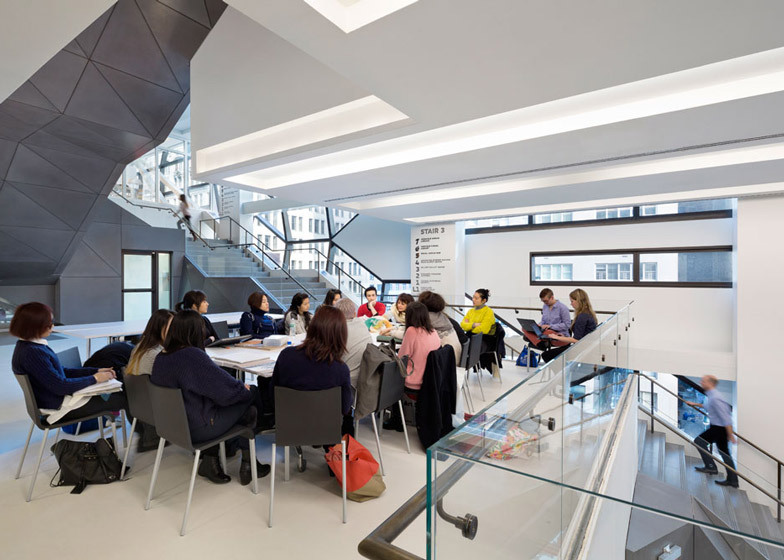 For nearly a century, The New School has been at the forefront of progressive education, with design and social research driving approaches to studying the issues of our time, from democracy and urbanisation, to technology, sustainability, and globalization. 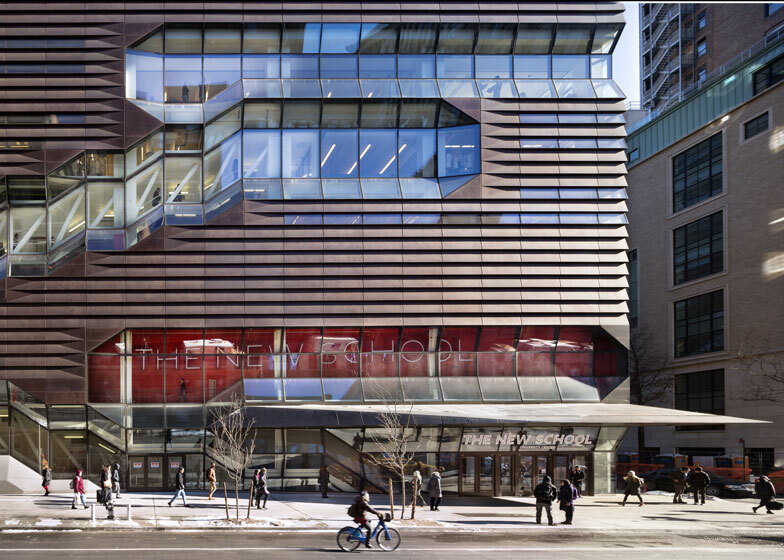 Over the past 15 years, The New School has built on this legacy to grow into a major degree-granting university, with nearly 10,000 undergraduate and graduate students. But, in recent years, as the school outgrew its longtime home in New York's Greenwich Village and found its real estate holdings spread across the city, from the Financial District to the Upper West Side, this pedagogical model proved challenging to maintain without the physical plant to support it. 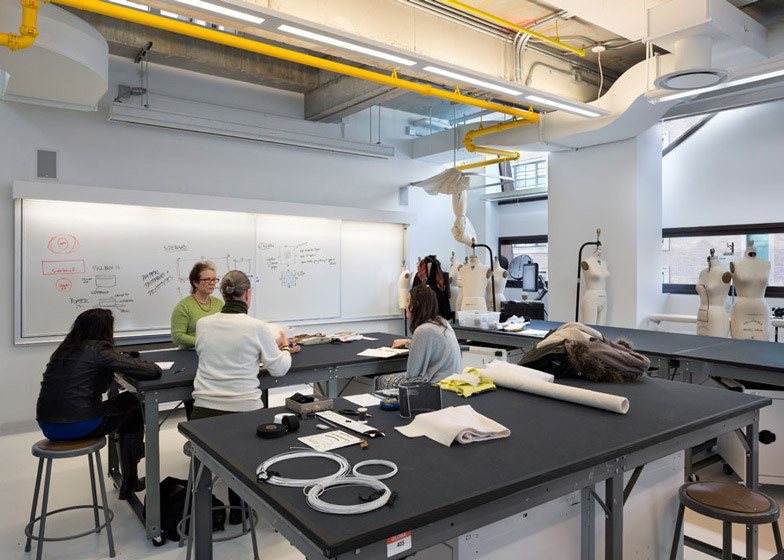 The University Center both supports and furthers this model through its innovative design and responds to the school's increasing demand for state-of-the-art, interdisciplinary spaces. 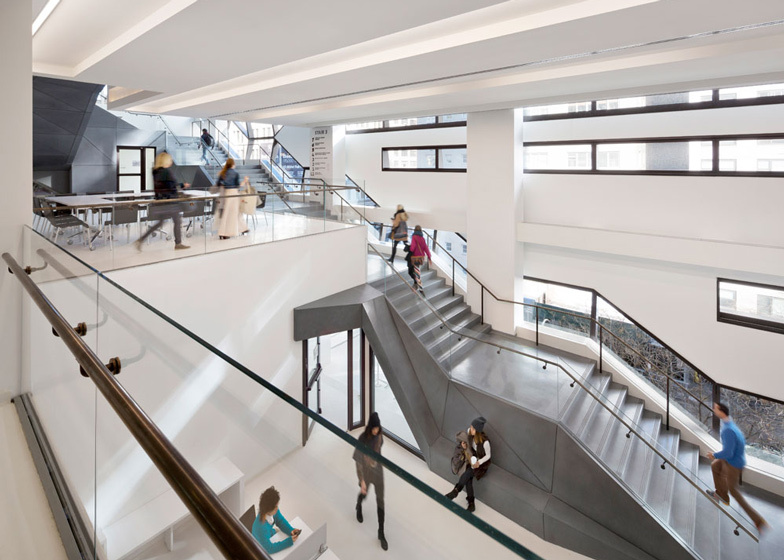 The University Center adds 375,000 square feet of academic and student space to The New School's Greenwich Village campus. The 16-storey centre houses design studios, laboratories, interdisciplinary classrooms, the main university library, a nine-floor student residence, an 800-seat auditorium, a café, and flexible academic and social spaces for student activity. Conceived as a campus within a building, the University Center transforms the traditional university environment. Rather than compartmentalise learning, living, dining, and socialising spaces, these functions are situated in a vertical configuration, creating strategic adjacencies and heightening the university's commitment to interdisciplinary learning. 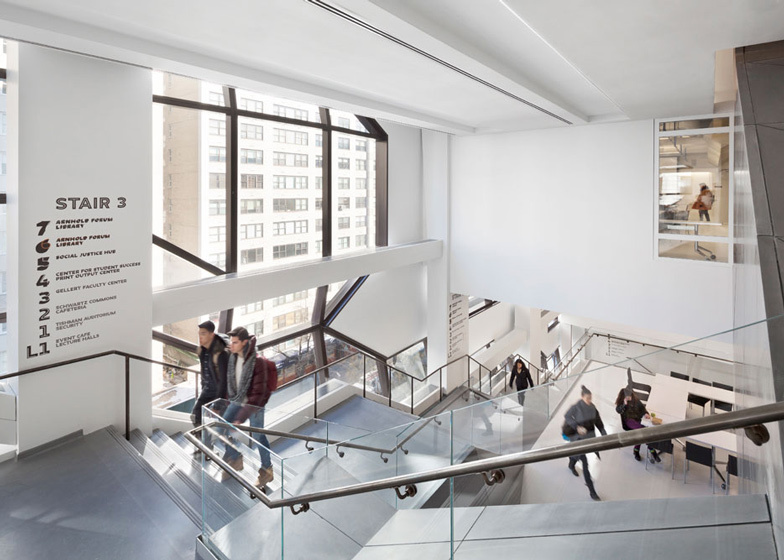 Connections between classrooms, studios, library, cafés, auditorium, and student residences take the form of stacked staircases and "sky quads" that facilitate the chance encounters vital to the cultivation of discussion and debate at The New School. This innovative interior organisation isexpressed in the exterior of the building. Tightly woven, purpose-built spaces clad in hand-finished brass shingles contrast with the open connective tissue of the stairs and quads visible through a glazed skin. The exterior mediates between the cast-iron facades of the Ladies' Mile Historic District to the north and the brownstones of the Greenwich Village Historic District to the south and west. 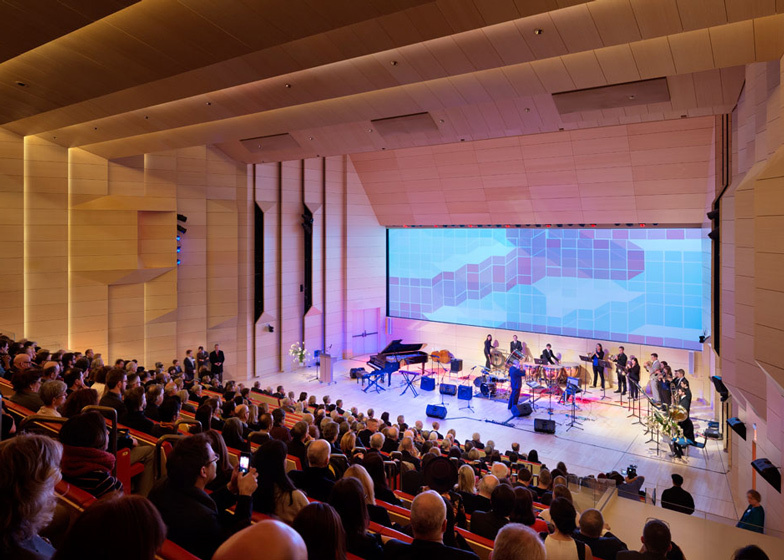 Located at the intersection of Fifth Avenue and 14th Street, the University Center broadcasts the experimental nature of the school's new home, creating a dialogue between the campus community, the local neighbourhood, and the city. With its 230,000-square-foot, seven-storey campus centre (located in the building's base) and 130,000-square-foot residential tower, the University Center reimagines the organising elements of a traditional campus, from quads to classrooms and living quarters. Vertical, horizontal, and diagonal campus pathways work together to facilitate movement through the building, while increasing opportunities for interaction among students and faculty from across the university. Academic spaces are flexible and easily adaptable, and can be renovated or reconfigured with no impact on power, data, or lighting to meet changing needs. Raw finishes and an exposed mechanical system further ensure flexibility in the academic spaces. To bring light into the 30,000-square-foot academic floor plates, clerestory windows line both walls of the main corridor. Horizontal windows and light shelves naturally illuminate classroom ceilings, reducing lighting loads. The University Center's system of double stairways plays a critical role in the life of the building; it works in conjunction with skip-stop elevators to move large numbers of students vertically through the building. Stacked one above the other, the fire stair is designed for quick circulation, while the broader, open "communicating stair" allows for travel between floors at a more leisurely pace. With faceted walls clad in glass-fibre-reinforced concrete panels, the high-use stairways are a place for chance meetings between students and faculty, and encourage social interaction and interdisciplinary exchange. Circulation paths that weave vertically, horizontally and diagonally through the building lead into and activate sky quads - interactive spaces that also orient users due to their adjacency to stairways and corridors. Like the "local" and "express" stairs that link them, the sky quads are intended to perform as social spaces, promoting formal and informal encounters between students and faculty, as well as supporting academic and leisure activities. These interactive spaces include student lounge areas, student resource centres with adjacent meeting rooms, study areas, cafés, and pin up spaces for design studios. To avoid crowded conditions and delays during class-change times in this vertical campus, peak elevator demand is mitigated through the combination of the intuitive system of stairways and a skip-stop elevator system. During peak times, the elevators stop at floors one, four, and six, and stairs are utilised to access the intermediate floors, while at off-peak times, the elevators stop at all floors. Envisioned as a model of energy efficiency, carbon reduction, and sustainability, the building anticipates 31 percent energy savings over a code-compliant school. Both passive and high-tech solutions increase energy efficiency. The envelope of the building is limited to 35 percent glass, which decreases solar heat gain while optimising interior daylighting. The shingled cladding shades the windows up to 20 percent during daylight hours. An ice-storage system, located in the second basement, uses electricity from the power grid during off-peak times to freeze water in a series of chambers; the ice melts during the day, reducing consumption during peak times. Heat recovery wheels recover heat from exhaust air and help heat supply air, saving energy. A green roof, funded in part by the New York City Department of Environmental Protection, mitigates the heat-island effect, as well as storm-water runoff, capturing water for both gray-and black-water treatment facilities in the building. Waterless urinals contribute to potable-water conservation. Composting is employed with an in-vessel composter in the cafeteria. The building serves as a living element of the curriculum, providing on-site training to the next generation of green leaders to students in environmental studies, sustainability management, and urban design. Design elements that demonstrate architectural, structural, mechanical and green building strategies are visible through signage and working exhibits. Back-of-the-house systems have been transformed into instructional spaces for New School students and facilities staff, as well as for professional organisations and unions, who are expected to use the building for hands-on training. A central stair is the principle design feature in the University Center - a focal point both inside and outside the building. These stairs are intended as the principal means of circulation through the building for the physically able. Through the use of clerestory windows in hallways and on the façade, the University Center provides for daylighting along paths of travel, and the design is organised to encourage walking between destinations, as well as spaces for social interaction. The building provides bike storage rooms and showers to encourage cycling, walking, and running between home and school. 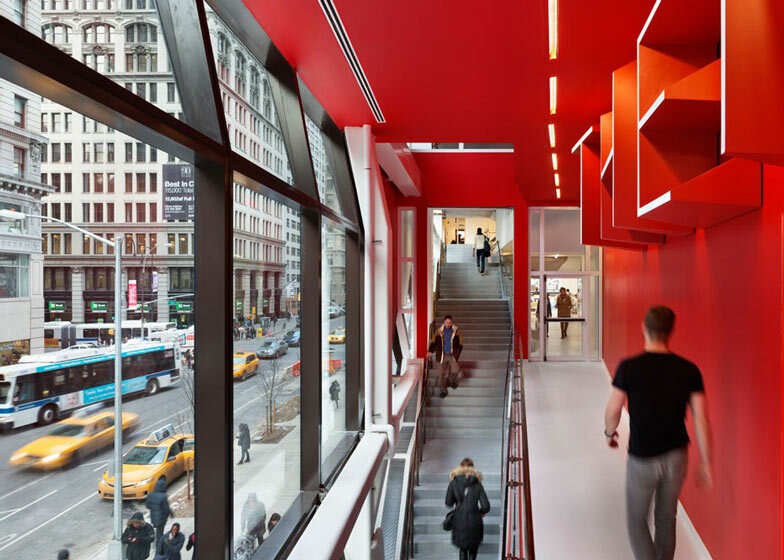 The building was recognised by Former Mayor Michael Bloomberg as a model of the successful implementation of the "active design" strategies that are part of New York City's anti-obesity and health initiatives. A co-ed residential tower for more than 600 students occupies floors 8-16 of the University Center. An amenity space on the lower level is accessible only by residents and consists of a large common room, art studios, an exercise facility with gym equipment, soundproof music practice rooms, a study hall, bicycle storage area, mailroom, and laundry room. The University Center has three dining areas: a 280-seat cafeteria on the second floor, an 80-seat library café on the seventh floor, and a 60-seat event café on the lower level off the entrance lobby and auditorium.